The media frenzy is in full swing now, urging us to buy gifts, be joyful and prepare for the festive season. But if you’ve lost a loved one during the year, this Christmas will be different. 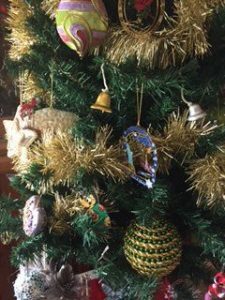 Here’s some of our coping strategies – things which have helped us to make the best of the Christmas traditions, even when we’ve suffered the loss of our own family members. Individualism is the hallmark of the twenty-first century – so celebrate Christmas in the way which feels right for you, and your family. Don’t feel you must participate in events. You may wish to gather with others who share your values, and understand your needs. Women are often under great pressure at Christmas – shopping, cooking and cleaning. If you’ve always been the main organiser for Christmas Day festivities, don’t feel that you must continue in that role – make a change. In my childhood, on top of mum’s wardrobe, there was an old brown suitcase filled with Christmas decorations. We were filled with excitement when dad cut down a pine tree, and we could decorate the tree. Some of my childhood decorations are still used every year – (although the tree’s an artificial one now). For instance, there’s a number of tiny metal bells, which are greatly treasured. Over the years, we’ve added to our collection of Christmas decorations. We’ve chosen special ones to commemorate the lives of our deceased family members, and these symbols are lovingly placed on the tree. For example, my dad loved bright, glitzy things – so his decoration is a large green and gold shiny globe. On the other hand, my mother-in-law’s decoration is an angel – it typifies her love, guidance and caring for her family. These decorations were sourced from chain stores. They don ‘t have to be expensive. But they’re chosen to typify the spirit of those absent. Many bereaved people are relieved when the weeks leading up to Christmas – and then the day itself – are over. They may realise that their anxiety in wondering how they’d cope with the day was harder than the actual day itself! And after all Christmas Day is just that – it’s only one day.